Jungle Tamers Ltd was started from a passion and love for gardening by Sarah Downes in 2001. Sarah grew up in a gardening environment with her mother creating trendy landscape designs for home and her father always looking for areas to expand his massive vege garden to grow more beans! Sarah admits to being a gardening addict and spends any spare time reading the latest English gardening magazines or wandering through garden centres and plant nurseries looking for a perfect plant for a customer. "I am lucky enough to have found a job that truly is my passion" Sarah says. 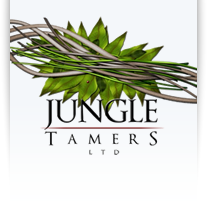 Jungle Tamers Ltd has a team of dedicated and enthusiastic staff. Each staff member brings to the business their own individual strengths, which means we can offer a wide range of services to our customers. "We hire people on their love for gardening, ability to work hard and do the job extremely well to ensure we meet our client's needs". "We often receive comments on how hardworking we are and I believe this is crucial as our services are definitely seen as value for money". Constant learning is a huge part of the business. WE ARE COMMERCIAL SITE AND GARDEN MAINTENANCE SPECIALISTS. Courses such as Health and Safety stages 1 and 2, Farmsafe chemical course, Farmsafe course, Farmsafe health and safety, Level 3 Certificate in Organic Horticulture, QEC, (3 years) and the combined personal experience of the team ensure we can help you.